Over the last few weeks, I have seen a lot of the resist signs my friends held up at protests and marches around the world. This week’s 1-minute video is a collection of photos my friends (and their friends) have provided of their resist signs and beautiful faces. THANK YOU! In the almost 7 years I’ve been making these weekly videos, I’ve never published a video I didn’t shoot – except the 2 videos my dog filmed (and at least I assisted). But these few weeks have been very different, and it was time for me to take a stand with this video series. And my perspective of the protests has been through the eyes of my friends. Unfortunately, I wasn’t able to march with them in New York City, DC, Berlin or anywhere really. I wish I had been there. There is so much I love about these pictures and signs. I love the people, I love their messages, I love their energy and commitment, their spontaneity and cleverness. And I love to think that we are all free elves (no matter what package we come in). I made this video to spread these messages and to give a kind of permanence to the actions. While I got the permission of everyone I named in the video, I failed to get permission for every face in the video. If you take offense to being in the video, please let me know, and I’ll do some editing magic. 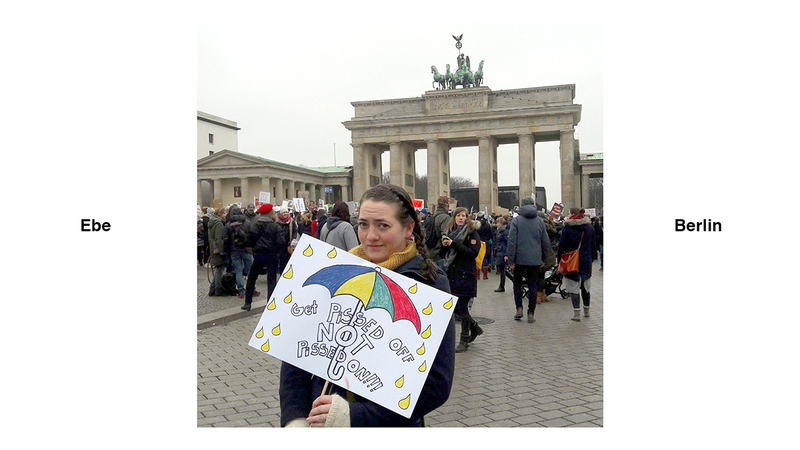 When contemplating the title, I deliberately chose “resist signs” – not “protest signs”. For one, because some signs are actually “support” signs. But more importantly, I strongly believe in the term “resist” for these days and times. It’s a time when we should not just sit quietly and take what is happening in this country and the world. We don’t and can’t all resist in the same way. My way this week, was to resist making another pretty nature video. That’s what I thought I could do this week. But I couldn’t have done it without YOU. Thank you to everyone, who took photos, sent me photos, allowed me to show a photo featuring them or their sign and an extra special thank you to everyone who has been going out on the streets on behalf of humanity! The photos were all taken in January and February 2017 at various marches, protests and rallies in NYC, DC, LA, ABQ and Berlin, including the Women’s Marches, anti-Trump protests and rallies against the “Muslim ban”. The song in this video is “Whats It To Ya Punk” by Jason Shaw of Audionautix. He has made a very diverse collection of songs available via a Creative Commons license. Thank you very much, Jason; and I hope you don’t mind having one of your songs used for this video! I highly encourage any of you to share YOUR PHOTOS of resist signs (as a link, as an embed, as an upload) in the comments. It would be so nice to see even more of your messages to the president, to patriarchy, to the world….